Paris Opera Ballet rehearses Nureyev's Nutcracker in "La Danse"
Having read in the NYT that Frederick Wiseman’s “La Danse” was one of the “finest dance films ever made,” I was set up for disappointment. What the movie has to offer is a sequence of beautifully-shot scenes of Paris Opera Ballet dancers rehearsing repertory. It gives you, literally, a top-to-bottom view of the Paris Opera Ballet, showing a rooftop bee-keeper and fish swimming in flooded underground passages. You get glimpses of people serving food in the cafeteria, seamstresses sewing ornaments on tutus, a janitor mopping the theater. The intention, no doubt, is to make you feel like you are there. The film certainly conjures up a sense of place but, unfortunately, it lacks coherence and narrative thrust. Recently I’ve experienced the transformative power of make-up from a dual perspective. On my journey to India in October, I saw a demonstration of Kathakali, a ritual dance-theater from the state of Kerala. Kathakali performers typically apply their make-up in front of the audience before the drama begins. Tourists, myself among them, get to watch (and take pictures) as the actors perform the preparation ritual. Painting their faces with brightly colored dyes, they assume the guises of characters from the dance-drama. The effect is is one of total transformation. The actor is unrecognizable in his mythic persona. The dance itself involves exaggerated facial expressions, executed with rhythmic precision. The elaborate make-up is integral to the characterization and also enhances the perception of the expressive movements. A couple of weeks later, I found myself in Montreal as the subject of an Art Nouveau makeover. My own elaborate hairdo and make-up were for a video shoot arranged by Moment Factory, a multi-media installation company based in that city. The idea was to make video projections of me dancing “a La Loie” which will be included as part of the Fête des lumières in Lyon, France this coming December. The projections will be large-scale, so the organizers wanted to make the face and overall effect quite dramatic. Loie herself embodied the spirit of Art Nouveau, so the makeover was period-appropriate. As inspiration, the office wall where I was being “done” was adorned with images of Nouveau-style women: trailing locks of hair adorned, seemingly spontaneously, with garlands of flowers. After three hours in the hands of make-up artist Laurie Deraps, I had abundant hair-extensions, false eyelashes, faux flowers and pearls artfully arranged in around my hair and face. Looking in the mirror, I saw myself transformed into a fantasy from another century. In October, we performed in front of our biggest audience ever — 65,000 live spectators and a television audience estimated in the hundreds of millions. For real! 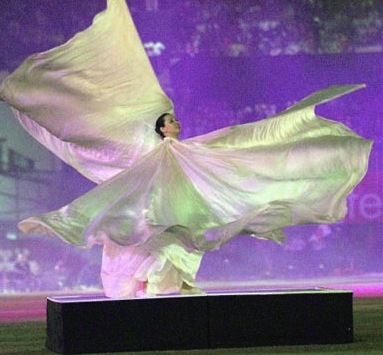 I was invited along with seven Time Lapse Dancers to participate in the opening ceremonies of the Champions League T20 international cricket tournament in Bangalore, India. We were just one of the acts which included appearances by the singers Chaka Kahn, Shaggy and Jamelia, as well as (among others) the daredevil-kung-fu Shaolin monks, four male acrobats, about hundred Indian youths forming lotus flower formations, a laser light show and fireworks. So what does it feel like to perform for so many people? Certainly I had nerves before hand, but once we were out there I felt strangely calm and alone. Because the arena is so vast–over 100 meters in diameter–I was far away from the fans. And, as I stood on a small platform apart from the rest of the company, I was literally in my own isolated sphere. This was violated only by the over-eager camera man whose head collided with my sticks several times during the spinning sequences. Once our first number was over, we had the fun of watching the rest of the show from the arena. The finale, which we never rehearsed with the actual music, was an improvised free-for-all with the entire ensemble. Such a glorious moment, whirling under fireworks as the crowd roared, enjoying the spectacle and anticipating the game to come.